I was reminded of this when Hilton of Inkwatu emailed me recently to ask about banh mi before he embarked on his very first Vietnamese sandwich. You can click on the link to read his story. It's Bastille Day, which means little to me except for the French contribution to Vietnamese cuisine. I made this when my brother and cousin Q's little brother were over. We sat on my porch to eat them so the crumbs could easily be washed away later. It reminded me of Sunday mornings when my mom made savory braised meatballs with lots of juice. My dad would go to the Vietnamese bakery to buy fresh Vietnamese French bread. The sauce was so yummy that we'd dip the bread into the pan. Sadly, the restaurant versions of banh mi xiu mai have always been rather dry and bland to me. Or maybe not sad because I think my version is loads better! This version was made with my pillowy soft homemade bread. Again, this is more an assembly list of instructions than a recipe. Assemble all the ingredients, except pickles, cucumbers, and cilantro. Put in the toaster oven for about 5 minutes. Add in the pickles and greens. Who made my recipe for banh mi xiu mai? m.o.M. said, "Yummy, yummy, yummy! I've got Banh Mi in my tummy!" 1 year ago today, ramen with panda and puppy faces. Beautiful! How on Earth do you find the time to make all your individual ingredients! This great looking sandwich and Bun Cha Hanoi have so many things to assemble and cook, I can't imagine trying to do that after a long day at work! I guess when cooking is one of your biggest passions you make the time huh? Looks delicious and I can't wait for the recipe. . .
eeeeee! this looks so good! i had my first banh mi sandwich recently at momofuku in new york and loved it. thanks for sharing. This looks so meaty and refreshing all at once Dub C! Such a cute scene of everyone munching these on the front porch. hey...my husband bought this for me from the Vietnamese supermkt. It is delicious. Yumyum, will try to make it myself one day... Thanks. Girl, I call that a heckuva recipe, that ain't merely a listing of ingredients! Looks great and I can't wait to catch up on the Vietnamese recipe posts on one of my fave food blogs! That wedding biz took me out of commission for way too long! Oh, I love vietnamese sandwiches and this looks terrific. I love that crusty bread along with the veggies. I'm a cilantro fan, too. Yum! This is such a great blog- keep up the good work! That meatball sandwich looks really good! that sandwich sounds like it took quite some effort and time to make...and frm the looks of it, it must be worth it! 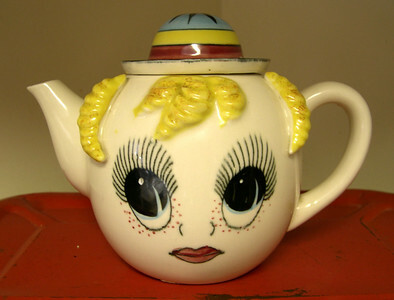 Well, for starters my blog isn't real time. These sandwiches were actually made last August. :P I always have a jar of carrot and daikon pickles in the fridge. The meat cooks pretty quickly. I spend maybe half an hour, sometimes an hour in the kitchen. It really doesn't take long. Ah, well, the bread recipe isn't anything to boast of. But the meatballs and pickles are the important parts anyway. 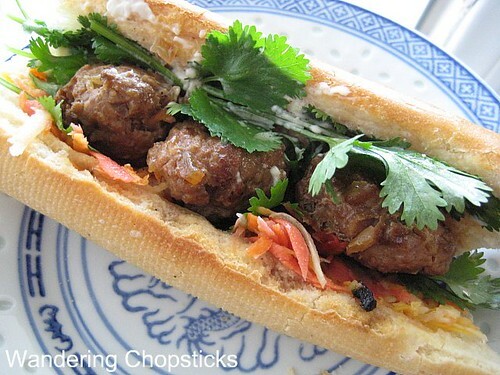 I've got several other banh mi recipes you can check out too. But the bread is the hardest part to figure out. Oh, but you must have a real Vietnamese banh mi. Momofuku, although I'm sure is very good, isn't a Vietnamese restaurant. Ha! I'm lazy and did not want to sweep bread crumbs everywhere. Crazy you! "Wedding biz" indeed! Welcome back! And congrats again. All the components that make up a great sandwich! Thanks but it was really quick and easy to put together. Wow, that looks so good. The only Banh Mi I've had in Montreal are the chicken or pork ones. I've never seen one of these. I will have to make inquiries. did you ever post the recipe for the meatballs! I did. Just totally blanked on linking it up. It's fixed now. Thanks for pointing it out. Hi there, I really appreciate your post as it's quite infuriating not to be able to find any decent banh mi's where I live (in Hong Kong) so I've resorted to making my own. Actually, I was hoping you could provide some guidance as to the sweet tomato sauce which adorns these meatballs most of the time when I used to get them from banh mi joints in the US and Canada. The first time I had these meatball banh mi's were in the aforesaid sweet tomato sauce so I was hooked on this particular combination from the start. I actually really enjoy this sweet tomatoey concoction and was wondering if you could give me some pointers as to how such a sauce can be replicated at home. Would adding ketchup to this recipe work? I'm really clueless when it comes to cooking so any advice is much appreciated. Thanks. No, no, don't add ketchup. Just add tomato sauce or paste into the meatballs while they're being braised. The sauce will be absorbed by the meatballs and thicken the sauce. My mom use to make this for us when we were younger--well, her version with left over spring roll meat filling. But she would steam the xiu mai and we just eat it in the baguettes (no veggies, but I bet the pickled daikon and carrots would be yum) with Maggi Seasoning Sauce. I've made plenty of meatballs with leftover springroll filling. Waste not, want not! I just found your site and all I can say is, "WOW!" 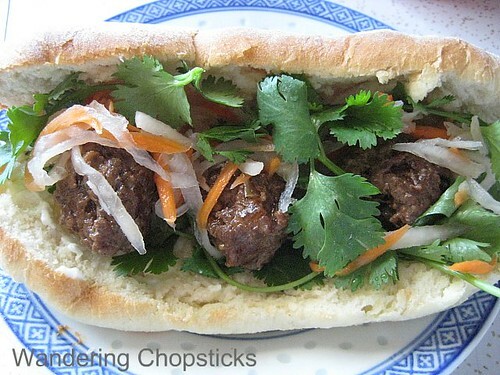 I'm going to make the Banh Mi Xiu Mai this weekend. This looks absolutely delicious! Already have the chicken livers soaking in milk. Now to find Daikon radish. Is there anything I can substitute? Did you? How'd it turn out? Daikon radishes are rather unique. Perhaps parsnips? Or just make vinegared carrots and onions. Great stuff! I adjusted the recipe a little for a weeknight meal. Jimmy Dean pork sausage huh? Whatever works!